Podiatry or podiatric medicine is a branch of medicine devoted to the study of, diagnosis, and medical treatment of disorders of the foot, ankle, and lower extremity. The term podiatry came into use in the early 20th century in the United States and is now used worldwide with countries such as the United Kingdom and Australia. A Doctor of Podiatric Medicine (DPM), is a specialist qualified by their education and training to diagnose and treat conditions affecting the foot, ankle, and structures of the leg. Podiatric physicians have extensive background knowledge in human anatomy, physiology, pathophysiology, sociological and psychological perspectives, general medicine, surgery and pharmacology. Specialist podiatric physicians are podiatrists who are qualified by additional postgraduate training or fellowship training and experience in the specialized field. 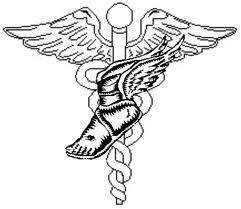 Within the field of podiatry, US trained podiatric physicians rotate through major areas of medicine gaining exposure and practice to areas including but not limited to: surgery, sports medicine, bio mechanics geriatrics, internal medicine, diabetes, vascular, neurological, pediatrics, dermatological, orthopedics, or primary care. The older title for podiatrists is “chiropodist” and may be used by some clinicians. In many non-English-speaking countries of Europe, the title used may be “podologist” or “Podólogo”. The level and scope of the practice of podiatry varies among countries. The professional care of feet was in existence in ancient Egypt as evidenced by bas-relief carvings at the entrance to Ankmahor’s tomb dating from about 2400 BC where work on hands and feet is depicted. Corns and calluses were described by Hippocrates who recognized the need to physically reduce hard skin, followed by removal of the cause. He invented skin scrapers for this purpose and these were the original scalpels. Aulus Cornelius Celsus, a Roman scientist and philosopher, was probably responsible for giving corns their name. Later Paul of Aegina (AD 615–690) defined a corn as “a white circular body like the head of a nail, forming in all parts of the body, but more especially on the soles of the feet and the toes. It may be removed in the course of some time by paring away the prominent part of it constantly with a scalpel or rubbing it down with pumice. The same thing can be done with a callus. Until the turn of the 20th century, chiropodists were separate from organized medicine. They were independently licensed physicians who treated the feet, ankles and related leg structures. Lewis Durlacher was one of the first people to call for a protected profession. He held the appointment of Surgeon-Chiropodist to King George IV, King William IV and Queen Victoria. He tried to establish the first association of practitioners in 1854, although it would take another century to come to pass. The first society of chiropodists, now known as podiatrists, was established in New York in 1895—and still operates there today as NYSPMA. The first school opened in 1911. One year later the British established a society at the London Foot Hospital and a school was added in 1919. In Australia professional associations appeared from 1924 onwards. The first American journal appeared in 1907, followed in 1912 by a UK journal. In 1939, the Australians introduced a training center as well as a professional journal. The number of chiropodists increased markedly after the Great War then again after World War II.